The first step of what may be a new phase in the political struggle for Berlin will be made today by the Communist-controlled Socialist Unity Party of the Soviet sector. The SED, as it is known, is calling a mass meeting for five o'clock this afternoon at Potsdamer Platz, that hot spot in this divided city where the American, British, and Russian sectors join. 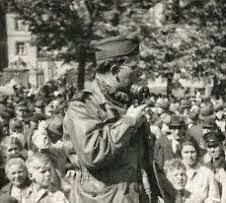 The leader of the East Berlin party, Hans Jendretzky, will address the gathering. The title of his speech is "What is going to happen in Berlin?" The usual marching orders have gone out to the factories and the faithful. There will be the usual plethora of slogans and red banners. However, there is an uncommonly peaceful note in this latest Communist move. The band of the East German people's police will precede the speeches with an hour's concert. Western authorities have been wondering what the next step from the East would be, and some interpret this mass meeting as the first move by the Communists to seize the political initiative here. The Big Four modus vivendi agreement has resulted in an uneasy political quiet in Berlin for the past month. The West Berlin government is having budget troubles, there is a great shortage of West marks, and although consumer goods are increasing, prices are too high for the ordinary person. Also, the West Berlin government has to face an increasing unemployment problem. Thus it is believed that today's Communist-inspired mass meeting will be the first of a series of moves to capitalize on West Berlin's economic difficulties. No particular trouble is anticipated at today's demonstration. However, special detachments of West Berlin police will be on hand just in case. The American, British, and French commandants meet today to study a complaint by West Berlin rail workers that the Russian-controlled elevated is not living up to its promise to pay sixty percent of their wages in West marks. This was part of the agreement that put the striking men back to work last month. Nothing specific was achieved in yesterday's four-power conference of economic experts. They will meet again on Thursday. Western Germany's leading Communist, Max Reimann, was released from jail by British authorities this morning. He served sixty-five days of a ninety-day sentence for conducting illegal political meetings in the Ruhr. At Düsseldorf, the British say Reimann was set let free short of his full jail sentence for good behavior. Communist party members already are hailing the release of Reimann as a great Marxist victory. Here in Berlin the three Western commandants have officially protested to Russian transport authorities for failure to keep their word in the recent elevated rail strike settlement. The anti-Communist independent union presented written evidence yesterday that more than a thousand of the returning strikers are not getting West mark pay as promised by Soviet authorities. Yesterday afternoon's Communist rally in Potsdamer Platz drew about 25,000 persons and failed to produce any excitement, although small boys standing on the surrounding ruins kept an intermittent barrage of pebbles flying toward the speakers' stand. The theme of the speeches and slogans was a call for a unified Berlin, a National Front for Germany, and a single currency. Economics experts of America, Russia, Britain, and France will meet again today in still another attempt to follow out the orders of their foreign ministers and normalize life in Berlin. This will be the third time the committee of experts have met, and thus far the only results have been pleasant but pointless conversation. British authorities say today that they will press for a Russian answer to two protests now pending. One is on the closing of all but one crossing point to truck traffic into this city. The other protest concerns the failure of the Soviet-directed elevated railroad to keep its word and pay returning strikers in West marks. Leaders of the anti-Communist railroad union said today that West Berlin rail workers may be forced to strike again if their men do not get the promised wage settlement. However, they emphasized that no new strike is planned until they are absolutely forced into it. The Communist propaganda machine is getting up a head of steam for a new drive to capture German support for the elections in West Germany on August 14. Last Sunday Soviet political commissars met with leading German Communists. The Marxist Germans were upbraided for failing to sell the latest party propaganda line. This line is a bald-faced appeal to German nationalism, urging the establishment of a so-called National Front under Communism to prevent the split of the country into Eastern and Western governments. These strategy conferences continued on Monday and Tuesday. The result was the sudden calling of a mass meeting at Potsdamer Platz two days ago. Tomorrow the People's Congress of the Soviet zone will meet in its new home on the site of Goebbels' propaganda ministry. The words will be different, but the tune will be the same. A new Communist peace offensive appears to be in the making in Germany today. 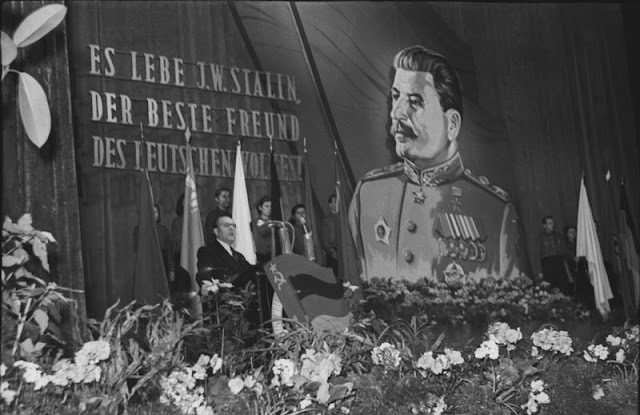 The German People's Congress of the Soviet zone opened its summer session in East Berlin this morning, and if the speeches of the leading German Communists are any indication of new Russian policy, we may be in for a period of sweetness and light in the coming months of East-West relations. Otto Grotewohl, one of this country's leading Communists, set the theme of the congress in declaring that the recent foreign ministers conference in Paris means the end of the Cold War. German people should take heart, he said, because at Paris there were the first glimmerings of a solution to Germany's problems. They should look forward with confidence to another Big Four conference this fall. Grotewohl asserted that the Paris modus vivendi agreement demands that the August 14 election for the West German government be called off, and that Germany should unite under the Communist-sponsored National Front. These latter statements are old stuff, but it is a far cry from similar declarations only a few weeks ago when these same speakers were lashing out at the West in barroom language. I am informed that Soviet authorities are considering giving up their plan to establish an East German government to oppose the West German republic we are now forming. If this is true, the strategy now is to promote the National Front idea but not to formalize a political split between an East and West German government. Meanwhile, there is beginning a gigantic political sales campaign from East Germany to sell the National Front as the only way to national unity. This time the party intends to use persuasion instead of threats. Eastern Germany has a Soviet-style two-year plan. The story goes that a railway repair shop in Saxony was far behind its production quota and an investigation was started. In one section of the shop it was found that during the past six months 6,500 man hours had been lost. The reason: the men were attending meetings called by the shop's political commissar. The subject of the meetings: "How to increase production under the two-year plan."